Communities of Resistance! Sites of Hope and Peoples Sovereignty! Songs of hope and resistance filled the ground floor of Sci-Bono Discovery Center in Newtown, Johannesburg throughout the session of the Southern Africa Permanent Peoples Tribunal (PPT) held on the 9th -11th of November 2018. On the last day of the session, there was a deep silence as those who are affected by corporate impunity listened to the President of the session Dr. Wallace Mgoqi and Ms. Makoma Lekalakala present the Jurors’ initial Statement. Then shouts of ‘Amandla’ reverberated throughout the whole room as participants heard their testimonies, demands for justice and an end to corporate impunity incorporated in the statement. The 3-day powerful session conuded with the statement and an indictment that put-on trial Transnational Corporations (TNCs), complicit states and International Financial Institutions (IFIs) which underpin the widespread impunity, the destruction of livelihoods and the environment in the interests of corporate mega exploitation for profit. This PPT Session was the last leg of a three-year process of Hearings, where cases against TNCs were presented exposing their human rights violations with absolute impunity across the Southern Africa region. Two new cases were heard in this session while updated testimonies were provided in cases submitted to the previous PPT Sessions in Manzini, Swaziland (2016) and in Johannesburg, South Africa (2017). The new cases presented were: The Marikana Massacre of 34 striking workers at the Lonmin Platinum mine and the case of communities resisting the INGA 3 Dam project in the Democratic Republic of Congo (DRC). Although the Marikana Massacre happened 6 years ago, the families of those massacred and the workers have been denied justice. No charges have been brought against those who were implicated in the massacre and what also remains unresolved is the involvement of Cyril Ramaphosa, a former Lonmin director and former president of the National Union of Mineworkers, now the President of South Africa. Furthermore, no compensation has been made to the families of the slain workers or to those injured in the massacre. In order to survive most widows have been forced to take the place their late husbands’ in the mine – which is tantamount to semi-slavery and indentured labour and their children have been forced to boarding schools of the company’s choice, where they are isolated and labeled as the ‘Marikana’ children. The Association of Mineworkers and Construction Union (AMCU) representing the miners together with the organized community of Marikana in Rustenburg demand the recognition of their struggle to fight against the continued criminalization of the mine workers, to the end of Lonmin’s impunity and to find access to justice for the widows and children as well those who are the injured survivors of the massacre. The case about the proposed Inga 3 Dam project was presented by the community members that will be affected by the project. They stated that the project will lead to the massive displacement of 37,000 people whose livelihoods are based around the river. The community members also highlighted the fact that despite the existence of Inga Dam 1 & 2, it is mining companies who have benefited from the electricity produced by the hydro-electric power station and currently only 19% of urban and 1% of rural households have electricity. Even amid the growing concerns about the accumulated debt the project is going the bring, the proposal for INGA 3 is still being pursued. It seems as if the project is aimed at the expansion of mining and for the sale of electricity to South Africa. 50% of Cobalt production globally is mined in the DRC under intolerable conditions of work aggravated by military oppression. Expanding Cobalt production is being driven by the global demand for computers, mobile phones and electric cars. Evidence was also provided of the accumulated personal wealth of the absolute dictatorships of the Mobuto and Kabila Presidencies over decades as well as the involvement of the high-level military in the exploitation of the mineral resources of the DRC. The communities believe that engaging with the states involved will lead to halting the project and that is why they have already written to the South African government. The affected communities demand the withdrawal of the Chinese, Spanish and South African companies and state involvement in this project. They also called for a commission of inquiry into the role of South Africa and its guarantee to buy a large portion of the electricity to be generated by the project. Their demands also include the call for compensation to those who were displaced by the Inga 1 & 2 Dams. A cross cutting major concern in the testimonies has been the role of collusion between the state, the corporations and the media. a people’s delegation from Tanzania was jailed for 100 days in Malawi because they came for a fact-finding mission about the functioning of the Kayelekera uranium mine (closed due to the poor price of uranium). An appeal to the PPT was made to demand freedom of expression and the protection of whistle blowers. The Right to Say NO! – Ending Corporate Impunity. In South Africa the Amadiba Crisis Committee (Xolobeni) embodies the Right to Say No and has taken their case to the highest level, demanding that the Pretoria High Court declare that their community has the Right to Say No to titanium mining. In this way, juridical confirmation of the principle is being pursued to institutionalize the community’s right to refuse projects of exploitation from TNCs or the State including “projects of development via extractivism”. In addition, the strategy of this platform is equally committed to forging the alternatives of an economic model based on equity and justice. Above all, this Campaign recognizes that access to justice and the fight to end corporate impunity demands the strengthening of movements, affected communities, trade unions, women’s organisations, Indigenous Peoples and Migrant and Refugee Peoples in a broad mobilization and convergence of transnational activism and solidarity – across the region of Southern Africa, with the rest of Africa as well as globally with peoples in struggle in other regions of the world. The 3rd session of the Peoples Permanent Tribunal in Southern Africa became the fertile soil for the Right to Say No to develop and gain momentum. The momentum and the clear message of alternatives and resistance were then placed and solidified within the Thematic Social Forum on Mining and the Extractivist Economy that took place on the 12th-15th of November 2018. The apt message of the Right to Say No has become a means of resistance to a patriarchal and highly extractive development model that resonated with all those at the forum. The act of saying no is at the same time the act of saying yes to alternatives – alternative ways of living in harmony with the rest of the web of life. Therefore, it was inevitable that the Right to Say No became and is an integral part of the key objectives of the Thematic Social Forum. The forum was the global platform to launch and strengthen the campaign. 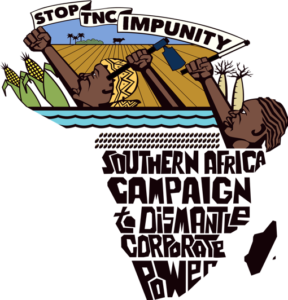 For the organizing group of the Tribunal, made up people’s organisations throughout Southern Africa, the outcomes of the Tribunal process lay a powerful foundation for the advancing of a campaign for the Right to Say No and a binding treaty regulating TNCs with respect to observing the fundamental human rights of the oppressed and exploited peoples of the region, especially women. No longer will communities and social movements fight alone corporate power but will draw on the solidarity built over the last three years to regain their sovereignty. The process of the Permanent Peoples Tribunal (PPT) on TNCs in Southern Africa began in Manzini, Swaziland in August 2016 and a second Session was held in Johannesburg, in August 2017. During these previous two sessions of the PPT, a total of 18 cases against Transnational Corporations in Madagascar, Malawi, Mauritius, Mozambique, South Africa, Swaziland, Tanzania, Zambia and Zimbabwe were presented to the Tribunal, ranging from mining companies and mega-dams to major agribusiness and land grab schemes. Some of these cases had significant recent developments and therefore were updated at this final session in Johannesburg, November 2018. The cases are available online.